The Metadata screen allows you to fill out the metadata values for an asset. These metadata values can then be viewed in the HTML source code of the page or used within your Site. For metadata fields to appear in the Metadata screen, a Metadata Schema must first be configured and applied to the asset, defining the fields and required information. For more information on how to create and apply Metadata Schemas, refer to the Metadata Schemas manual. The Metadata screen is shown in the figure below. Please note that the options on this screen are similar to those on the Metadata screen of a Standard Page in the backend. For more information, refer to the Metadata Screen chapter in the Asset Screens manual. 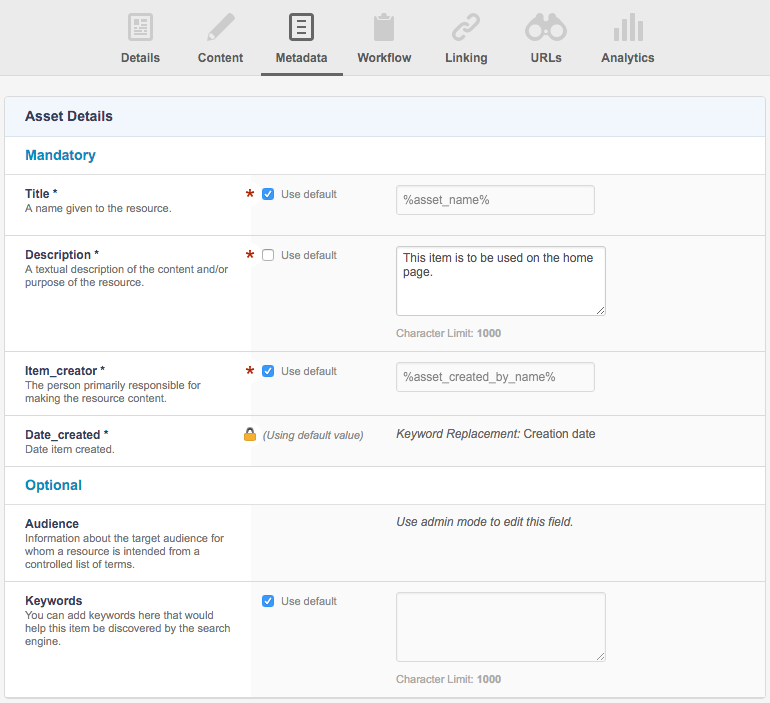 The metadata sections and fields configured in the asset's Metadata schema will be displayed on the Metadata screen. In the figure above, the Metadata Schema titled Asset Details has been applied to the asset, with two sections, Mandatory and Optional. If a metadata field is not editable, a lock icon will appear next to the metadata field. For example, in the figure above, the Date_created metadata field is not editable. A star icon indicates that the metadata field is a required field and that metadata must be filled in for this field. If there are any required fields defined for a Metadata Schema, the asset will not be able to be made Live until all required fields have been entered. Some metadata fields require the use of the Administration Interface to set metadata. These fields will display the message Use admin mode to edit this field, as seen for the Audience metadata field above. The method of editing a metadata field is determined by the metadata's field type. For example, a Text field requires you to enter the metadata as text while a Select field requires you to select the metadata from a list of pre-determined values. For more information on how to edit the different metadata field types, refer to the Metadata Screen chapter in the Asset Screens manual. When entering metadata, you can choose to use the default value of the metadata field by selecting the Use default option on the field. This default value is determined by the asset's Metadata Schema. Once you have finished editing the metadata of the asset, click the Save button.